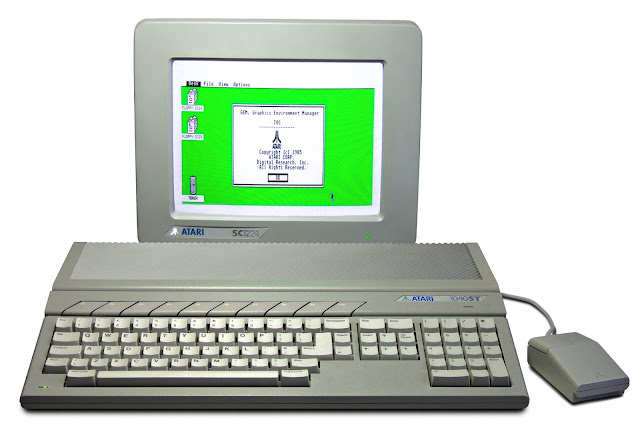 Launched in the summer of 1985, the Atari ST was a direct competitor to the Commodore Amiga. Cheaper than the Amiga but also based on a Motorola 68000 processor the ST was another key contender in the home computing market in the late 1980s. The Atari ST was much simpler than the Amiga in graphics and sound terms, but it could support MIDI devices which lead to it being very popular with musicians. The user interface was DR's GEM system that also found its way onto Amstrad computers and some PC clones. The history of the creation of the ST actually intertwined with that of the Amiga. Atari were an early investor in the Amiga's technology, but eventually that platform went to Commodore. But the rivalry was more intense because the Atari brand was owned by Jack Tramiel who had founded Commodore in the first place. Tramiel himself is an interesting character, aged 83 today, and a survivor of the Auschwitz concentration camp. An elegant all-in-one design, the Atari ST sold well for several years, and in 1992 it was followed up by the more powerful Atari Falcon which was only on sale for a year before Atari pulled it to concentrate on the unsuccessful Atari Jaguar console. Atari disappeared from the market in 1996, a couple of years after Commodore declared bankruptcy. However, as with Commodore, the Atari name refused to die and these days the descendant company concentrates on mobile and online gaming. And although the legacy of the ST is limited today, it did help to popularise gaming and the low cost helped many musicians produce their own music.